But the end never comes and she begs them all for another day, another night, just one more breath of their labored lungs. She begs and offers only a story to drag them through the pain and she feels weak and weary that she has nothing else to offer, nothing else to tear from her soul and give to them. The meeting feels so very far away now and the hope that burned like a comet in her heart feels further away than that. The dawn turns to morning as she walks between the rows of the sick. Soft light filters through and for a moment she watches the dust motes make shapes in the morning, winter chill. For a moment she blinks her gritty eyelids and wishes for slumber and fields of flowers that shed not pollen but star-light. She wishes on beams of sunlight that flit through the low, morning clouds. She wishes hard enough that it feels like her soul cracks open and bleeds and bleeds and bleeds like the bodies around her. It's only the chime of another set a hooves that pulls her from the sunlight and back into the world of bloody silks and fever madness. Moira. Isra remembers the name. And when she pulls it up from the languid weariness of her thoughts it feels like more than a name, more than some horse made of flesh and feathers and bone. “Moira.”She whispers as if she's whispering the wishes off of dandelions with spores of stardust and gold. 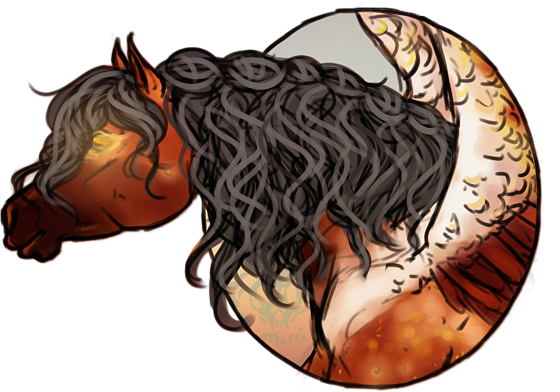 “Have you slept at all?” Isra presses her lips to the mare's brow, testing for fever from Moira's own wounds, left unchecked as she gave and gave to all the others weaker than her. Admiration almost brings a smile to her lips but she's to weary to do anything more than watch the way the other mare's wing doesn't hang quite right. It feels as if she's forgotten how to smile, how to dream her own dreams and let the story take her away, away, away. All she is now is worry and prayers that they will all give her another day, another night, another beat of their broken hearts. They've moved so many to the infirmary - those with one eye or banged up limbs, broken bones and dripping wounds too garish to patch up without proper supplies. Others are sent there to rest, to recover from heinous sights that will haunt them for days to come and let themselves drift in abysmal peace. There is so much work to do, she hardly knows where something ends and another thing begins. Crumbling walls. Drenched houses. Flooded fields where crops were once fertile and rich for the taking to provide for the entirety of the nation. But what is a nation if its people are not well enough to make it fruitful? It is her duty to tend to them, to put gauze over ears half torn off, to patch up the already scabbed arms that were cut when something or another fell, to pull water from lungs of those near drowned when the sea came screaming back in on her hidden cove. Such treasures she hid once more, yet so many lives she dared try and take. Moira is unwilling to let them be stolen away so easily. Through the night lit only by what fires could be managed she had worked. Tirelessly moving from person to person, seeing who required the most help. She does not feel time passing as others do, her focus solely on the patients that need her the most. Dawn breaks more quickly than anticipated, and with it comes the sound of a voice above the moans and soft sobs and gentle thank-yous whispered. Hoarse, croaking, probably as tired as Moira undoubtedly looked, Isra approaches. In the middle of applying a salve to a gash to stop infection and rubbing lavender about the young man's neck to calm him, golden eyes pause to look over towards her new queen. Unhurt through their perilous and trying catastrophe, she stands a beacon of hope despite the sorrow weighing on the dreamer's heart. For a moment, sympathy touches the phoenix' eyes, but quick as the lightning that came and went, it too is gone within seconds. There is no time for silly emotions like that. What will come will come, and she sure as hell won't go down without a fight. "Isra," she murmurs with a swift nod. Doesn't she realize there is bleeding to be stopped so their streets are not eternally red? Where is the kiss of night and sound of laughter? What happened to the magic that once ran rampant on a lover's tongue, the soft sigh of falling stars and tinkling music that was always about? It will not return with idle hands. So shock courses through her like ice in her veins when lips touch her own brow. Lips tip down, ears twitch before burying themselves in fallen curls from braids and pins to keep at least that from the injuries if nothing else. Easing back so there is distance, so that she does not feel like a bug under the microscope ready for dissection, the woman in red merely looks to the crumbling architecture and mourns its loss. "There are people who need mended and bellies to be filled. Sleep can wait for me. But you, sweet Isra, must rest your eyes. I can see it on your shoulders - the weight of the world. You are not alone. We are at your fingertips so that you do not break." She smiles for the first time that morning. Turning to the young man once more, she is quick to finish wrapping his arm send him on his way. Then, with all the efficiency and as much lackluster as she can muster, she turns promptly on her heel to press her shoulder against Isra's own. "This way, I think we've set up something for porridge at least for today. Let's get you some and a nice cup of tea to talk about what comes next?" Reassuring, calm, yet as distant as the sea that has retreated far down the coast once more. Just as she was raised - a serene presence to help another to wherever they need be in life. This... This is what Moira was born for. Not the sky nor the sea nor the arms of a cruel lover, but the healer, the helper, the one to guide and nurture others throughout the beginning, middle, and end of their lives. “But,” Isra starts and the smile on her lips looks like a bitter crack of heartbreak, a million diamond sharp edges that break up the darkness of her face. Her words are nothing more than the ring of falling pearls and stardust and she feels like they break and shatter where they clash against the silence. “who will care for you when the devils of sleep decide they will have you, willing or not?” She asks as their hooves turn to lead them both away from the infirmary. She allows herself to be led away as if she's the weakest of them all, with her tender knees and doe eyes that beg and pray and promise to break. It's easy for her to brush their shoulders together and let the winged mare take her from the sick and the sleeping. There are others to watch, other guardians to hold tight the keep against the day and the winter chill that reaches with clawed, reaper hands. So silently she lets herself be taken back to the porridge cauldron where soft pillows lay spread about in strangely cheerful piles of colors against the cold, dark floors. Isra says nothing until they are close enough for the pillows to brush at their hooves. She imagines the silk sings like a siren to them, whispers of satin against bone and dusted chants of dreaming against the distant thrum of rebuilding that echoes softly to them from outside the walls. Isra has survived much worse things than being tired and weary of the futures weight. She's worn crowns of chains and her soul has been made to remember the stories barbed wire can tell in words of blood when theiy are applied at just the right angle against tender, mortal flesh. And for a moment she wants to snap, to lash out and feel so very, very alive when she yells loud enough that the hidden moon might hear her and smile for the violence of her mind. Isra wants to shout and shout, to the stars and the sea and the dark demons that hide between the two. She wants to shout over and over again, I am not broken, not yet, not yet, not yet. She wants to yell until the words become a chant and a challenge. You will have to do worse than all of this to break me. Oh, she feels like a true unicorn in the silent place inside her, the one that cowers beneath the dark stain of her soul. It comes out in flashes and bursts of solar flare but this dawn she's too heavy, too like a stone to do anything more than feel a spark of star-fire flashing in her bitter, heartbreak smile. “Rest.” She says and perhaps a touch of that star-fire flares fleetingly bright in that request that comes out almost like a command. It's faint enough to fall and blaze like a comet tail when it does, dusted and silver and made for wishes. “And we can both eat and drink and I will tell you a story. Then we can talk about what comes when our hearts do not feel so broken with sadness. Sorrow is not made for dreams.” Her eyes flash like a glint of sun on the white foam of a wave, fleeting and blinding. It's a flash that feels like whimsy when one thinks of all things that might surf upon the flotsam. In those silent moments of judgement and intrigue, the stars seem to lean ever closer, glimmering down upon the two women who have yet to find sleep and peace in the aftermath of chaos incarnate. The phoenix does not flinch from the words thrown her way, for she's heard much worse whispered in dimly lit hallways - mutt, mongrel, you don't belong, you will never be a Tonnerre - so many other words more insidious than the threat of sleeping devils waiting to pounce. Fear is not something that shakes her core, the smile touching Isra's porcelain visage does not move her. In response, she simply raises a brow and shakes her head. Limp hair barely shimmies through the air, plastered to her cheeks and neck from the cold sweats upon her sides. Only when they enter the warmer chamber full of bodies on pillows and faces lined with tears does she feel the weight settle onto her narrow shoulders. Petite frame shivers for but a moment, and just as quickly she pushes on a straight face once more. There is no time to grimace, to be sorry for what they've all gone through. It is in the wake of disaster that all of Denocte must pull together. She will be their healer, their shoulder to cry on, the base of their pyramid... She will not be some helpless girl locked in the dark where no one can see her, hear her... She will not be helpless for her people. So she falls easily into a pillow after retrieving a bowl of porridge to split between the two of them, meets those star-streaked eyes that blaze like a morning glory, and just as stubbornly offers her hand for Isra to come beside her. Tucked arm in arm, Moira thanks the child that brings them both a cup of tea before looking once more to her Empress. How strange, she hums, that the storyteller shall now tell a story of her own creation for the entirety of their nation. But Moira feels in her heart that Caligo has chosen true to who all of Denocte needs. Isra is made of silver and gold with the heart of a dying star streaming endlessly through the sky. She is the northern lights floating lazily above, a beacon of hope that cannot be erased. After a sip and few bites of porridge she allows herself to lean into the queen, curious if this is even alright or proper. Never would Moira have been so forward, so bold with her previous Emperor and his ilk... However, she was still so new, so naive of this world and its people. Not so long ago she recalls his flashing grin and flaming eyes. This unicorn has that same strength and core of steele to lead them into the milkyway should she so choose. "Wash sorrow from your heart, burn it from these halls, don't fret now, Isra. We will heal and be born anew. We will be strong under your tender hand. Reap what you sow, and the benefits will be grand. If you'd like, storyteller, I can tell you of my home to soak away your sorrow." And she smiles. It's small, so easily missed upon her dark, carmine face, yet those golden eyes brim with memories worht a million lifetimes. How does she tell of the halls that were never in darkness? Of the people who lived in light and love and intrigue? Of Eluoan, the twins, even her dear, lost Estelle? It could take hours to describe the balls, the ceremonies, the Matron. Even longer to show the love of her parents and the fondness for Marquelle. Born in a world of art and philosophy and learning where she should want for nothing but her library when pulled away from it... How does one tell of their life before living to ease the heart of another's broken rage? The pillows sigh beneath her knees as she folds and falls upon them. Bits of dust rise up to dance in the rays of moonlight in the shifting red-light of firelight. Feathers too drift up with the dust, fewer in number but just as wild upon the currents of their movements and the tides of their breaths as the two of them inhale, exhale and inhale again. Isra for a moment forgets the fires and Moira and loses herself to the motes of dust. She sees incandescent things where the granules of dust tangle and glint like flakes of diamonds in the moonlight. Faces form in the beams of light, gap jawed and heavy eyed with the weariest of slumbers. There are elk and spiders and birds that scream and cry in heartbreak in the shifting shapes. She can see universes in the bolts of moonlight that feel to her like shards of lightning streaking through the hollowness of her exhaustion. When she exhales again it's a rumble of thunder the rattles loose the dust from the rays of light until she can see nothing but the droplets of her own breath. And when she breaks away her gaze as the last feather lands on the floor before her she can't help but feel hollow, as if she's lost something when her lungs erased the faces like the sun blows away dreams. Moira brings Isra the rest of the way to reality and she sighs as the pillows did as they tuck themselves together . It's an easy thing to tuck her head against a wing and forget that her soul still struggles against the cage of this body of hers. It's easier still to skip a breath until their lungs flutter like two firefly wings and their eyes blink together between light and darkness and silt-gilded memories. The food tastes like ash on her tongue between the lingering bits of sea-salt on her lips and the tea tastes like nothing but heat and water. Isra blinks but the burn never fades and her tongue still crawls and tingles as she swallows back both tea and what feels like a library of words. “Take me away then.” Her horn trembles against its bed of feathers, blood and salt. Each word is a breath and each breath carries on for a second and the fire is the only thing that seems to make any real noise at all. And when the silence feels like it might never end she closes and eyes and says in a whisper, “Carry me away on a current of your story.” Isra almost opens her eyes just to see the way her words might rattle loose dust from Moira's feather and what faces those motes of dust might create. But her eyelids start to feel like planets of weights and so she waits in her own personal darkness to be carried away like a leaf upon the sea. She hums as though a mother singing to her child, a lullaby as old as the sea and as soft as the night that neither could sleep through before. Dawn is a cruel mistress, beaming at them with bright eyes, smiling and welcoming all to a world of ash and sorrow.The sun does not care if the world is on fire or frozen or drowned. Water does not yield just because a life is returned to the sea and given a grave where others will appreciate them perhaps more than they had been when living. And through it all her soft, sultry tones swirl in time with the images that dance before Isra's eyes, her kips gently brush the unicorn's brow as she sweeps her hair back and strokes it reassuringly. Carefully her good wing curls around the newly anointed Empress of Denocte and she leans in near to begin her tail. Shadows from the fire dance on the wall and she pushes small gusts of wind to make it dance like the figures she paints. "I was not born of this land as you well know, in a place far away, across deserts that splay your skin, forests that swallow your fear, and mountains that crack your feet and dry your lips there is a place once at war that has found peace. We neighbor Nieve, a small country that is quickly expanding, and we neighbor Krilo who hold all of the Pegasi you could dream of. They take to the skies like clouds, float above the world on a lofty palace all of their own. There, they are free and open and loving. There, they do not care if you wear a horn or carry wings upon your back or have nothing but the skin you were given. For a long time, our history books told us we were at war, my family and theirs. The Tonnerres are a beautiful people full of rich culture and history and relics from the sea and from ages long gone. But we never took to the sky," she sighs like the winds that walk the many lands, eyes floating to the window high above as though she could taste the high air she shared with Asterion upon the cliffside. Was it really so long ago she danced alongside him covered in sugar and smiles? If she thinks too long on it, she would feel the sorrow build in her chest until it is a wolf hungering for more than her emotions, but the entirety of her heart itself. "Bound by the land, my people took care of it as though a second child. It provided for us when we could not, and when food was plentiful we began to build. Simple at first, small huts, tents hiked up near so that we could feel the heart of the family beat as one, and then larger. Gardens with grand arches, platforms for the few artists to sing, to dance, for all to be merry. Eventually, we built ourselves our Estate. There are many others, but the Tonnerres was always the largest that I remember. Those halls held me as a girl and I'd race through the Hall of Mirrors pretending to be in the sky. My mother, you see,>" she whispers now, crooning softly into Isra's ear. "My beautiful, brave, passionate mother was made for fiery dances upon the breeze. She was never meant to be tied down, yet she found a soul that lit her aflame. Anselme, my father, found her in the markets when visiting Krilo. An artist... That's what she was." And it is a sadness so profound that fills her, that halts her words and makes her breathe as she remembers wings now clipped so she may never fly again, eyes so sad and hands that do not paint as they once did. "He fell in love with the way she painted the world in rosy tones, and despite the Matron's refusal to allow them to wed, he took her as his own and she fell into the broiling cauldron of passion. From their union I came to be. I remember murals on the wall my mother helped me to paint, she taught me to let my heart soar even when I would not. When I was young and kept at home, there was laughter and love. We would stay up by the fireside at night, much like now, sweet Isra, and play games until my eyes were too heavy to stay open." Fondly she smiles, recalling those endless nights when she would fall asleep wrapped in her mother's arms and wake up in her bed, snuggled tightly between her parents. "Gizelle, that is my mother's name, she showed me how to love and how to taste the freedom we are so lucky to have... But we cannot stay young forever, and soon they pushed me into the classes all Tonnerres must go through before entering into the Trials no matter the outcome, I met others. Of course, true Tonnerres, they did not have wings, but when we are young we do not discriminate so easily. In the Estate, they teach you many things - to sing and dance and paint and sew, to cook, and of history, science, astronomy and philosophy. They teach you to think there... Ah, but my favorite - there is a ceremony where all eligible young men and women are presented to the family." Eyes drop closed as she remembers being dressed in a gown, strewn with jewels, and put on display for all Tonnerres to see. She stood atop the grand stairway and heard the whispers, the cruel jabs that she should not be allowed alongside her cousins... And she remembers how it was Estelle who stepped up alongside her, challenging any who dared even look the wrong way. "They preen you like a peacock, they pull out your best side to put you on display like a marionette. Ah, but Isra how beautiful it is, to celebrate children coming into adulthood. When all eyes are fixed on you, it's overwhelming I suppose, but it is so lovely to know that they will know who you are no matter whence you came from, for the Tonnerres are a sprawling family now. Estelle - my dearest Estelle - she stood beside me through it all. Estelle taught me to dance like I did not care, she brought more laughter than I could ever imagine that night. There were chocolates and cream puffs and wines from many places. I wish I could show you. You might enjoy the merriment." For a moment, she stops as time stands still, nuzzling her head over Isra's so that she cradles her nearer. It is as much a comfort to herself as it is meant to be for the woman who has seen so much and still presses on for all with such hope. The phoenix does not seem to mind the close proximity now, not when so much has been lost. "I wish I could show you the starlight that raised me." The day rises around them, time and smoke and dreams flitting by them like seeds of dandelions with each time Moira speaks a word and turns it to wind. Parts of Isra sink with the arc of the light as the pillows and the story tuck her into the darkness of some half-awareness. She tucks her nose to Moira and lets all the parts of her that are not trapped between the bones of a unicorn just float away. Her bones are clouds, her eyes bits of star-light above an endless and the dark canopy of a forest that looks as plush as a pillow. She is a mountain watching a war spark and smolder while her lips of stone sob rivers of snow and ice. Isra with her eyes closed sighs for the way her bones feel like wind and her flesh like feathers as she floats away a little further. Before them the fire sputters as if a great breeze reached between the walls and whispered to the flames, grow, grow, grow. Isra is there in the hallway, dancing between the mirrors while her hair floats like vines of ivy in a storm around her. You are more beautiful than them all, she wants to say, paint out the words with her dreams upon the soft down of Moira's feathers. Part of her though, wants to say the words to convince herself that she's not jealous of a world of mirrors painted with beauty instead of blood. But the story continues and she presses her eyes tight enough to see white and feel pain and lets her mind run wild once more. When Moira pauses and her breath flutters like petals in her throat Isra touches her nose to the other mare's throat and hums. She hums a song of the slaves, soft and sad. The way her lips vibrate make it seems that if she let it the song would grow and swallow a world. Isra swallows it though, devours the song when the story continues. This is not a story of slaves, but starlight and a world not devoured by the sea. Her lips seem sweet when she smiles and thinks of pastries and her teeth sting when she thinks of wine. But her belly feels nothing for it remembers only plain grain and mash. To her eating is only for surviving, never for enjoyment. And part of her remembers stealing an apple just so that she didn't dissolve down into cobwebs and grave-dirt. Moira's words fade away as they tuck each other close. Isra swallows her next breath and begs her heat to slow and restart so that even her insides are a reflection of this moment, this tangle of them and pillow and words. “Perhaps someday you will paint your world for me.” Her voice flutters against Moira and it feels like a kiss of a stardust on her lips when she presses them back to the other mare's throat. This is all Isra says, for a story-teller can always tell when a tale hasn't taken everything yet. And stories always take everything. Choking, how she coughs on the sentence that Isra utters, unknowing of the horrors hidden within glistening halls, kept behind doorways and tucked in crevices so none would ever see the rot that's crawled within. Instead, large, distant eyes turn to meet the soft, welcoming gaze of a woman (not a queen, not in that moment) who is there to listen to her story as it unfolds. How the phoenix' body burns and her wings ache and her heart tears in two. Loyalty to a home she never truly hated, but knew to be rotten now that she's been shown love, wars within her raging heart, burns the shadows that sink their claws in once more. Ice coats her voice when she turns, when she shakes her head, when the words so different from those moments ago flit out at last. "I would never show you a place so cruel." For it was a monstrosity of an estate. Not a home but a prison, a gilded cage to refine its beasts until they can speak as people do and parrot phrases so that none may see their claws, taste their fangs, or feel their poison deep in their blood. Like an apple, ruined at its core, she knows now that she should not have suffered so greatly and been left so scarred. But she is lucky, for others have had worse. "I will paint you their sunrises and the city of Kilo from whence my mother came. I will show you Eluoan and the twins and my sweet, sweet Estelle. I will paint Denocte in the colors of my family and then build a rainbow for their dreams to take flight. For you, Isra, I will show you the world I wished I was truly a part of, and that which I now know holds the deepest parts of my heart and soul. The Estate was as wonderful as it was horrible, as enlightening as it was imprisoning, and I never would have come here had I not first been there. Even in a court of nightmares, dreams are born. But you, you my sweet Isra, have shown me how to dream again. So for this, for you, I will paint Denocte with the story of a house that was not a home and perhaps someday you will know of the nightmares that are born and the monsters that are made. We are flesh and bone and terrors in the Tonnerre clan that I cannot ever come to fully explain." How is it that her throat is not soar even though it is raw? How is it that her voice is still there despite how it cracks and the hoarseness it shows? Admiration dawns anew for the woman before her, beside her, who comforts their court with stories instead of battles, with love instead of frigidity. She pulls the stars from the heavens to put in their eyes, and to her Moira silently vows that she will take care of this court so long as it shall deserve that. Too long. A silence stretches but it is not uncomfortable. There is no longer a drumming in her heart to spill tales of that far off land and those people who are not here. Of boys who wished to steal kisses and girls who did not conform to the standard quo and were shunned for it. Perhaps that ghost would rest for now, rest like the children who would no longer wake in Denocte, like the sea that pulled far from the shore and the birds in the sky that did not cry out and bring lightning to their doorstep just then. And so the phoenix tucks her head under the unicorn's, seeking comfort and warmth that was denied to her for so long, seeking friendship and trust and the frail, fluttering hope that beat within her breast. "I'm happy I found you. Thank you, Isra," she whispers, eyes drooping as though the energy has been sucked from her at last. They were up through the night, through the first breaths of dawn that now reaches her fingers through the stained glass above to play with dust motes and darkness alike. Colors rain down upon the two, painting their faces in shades of green and blue and gold, a new likeness of a goddess and magic of the world birthed in those silent moments that follow. A story ended, perhaps, but another was just about to begin once more. @Isra ovo this took way too long. here we are though ! "and if you see a fire from the shore tonight, it’s my chains going up in flames." Isra sets sail on the currents of Moira's words. Each cold word is a drop of water against the hull of her and each passionate promise a summer breeze billowing her her sails. Everything is soothing, a lulling hum of surf and sea and love flowing in that place between her bones and her soul. And when she blinks her eyes the blood and brine seem only like a nightmare. Surely this sweetness should be the only real thing in their world. There is no darkness here, not when Isra smiles and traces the pattern of Moira's wings at her side (no darkness between them, only light). Her own throat feels like fire when Moira tucks her head underneath her and begs silently for comfort. This, Isra thinks as she drops her neck across the other mare and hums, is the moment I truly became a queen. For the first time she knows it's not bravery she will lead with (she's not that sort of unicorn), but empathy. Isra will bleed a river for each drop of Denocte's suffering. Even now she thinks back to a dead forest filled with fat graves heavy with bone and char and frost. Beneath her belly her hooves ache with the need to keep running, to keep being a wild ghost of the forest instead of a monarch. Her horn aches too, when the rising sun glints through a window across the point of it. It aches for all the time it's been nothing more than a useless twist of bone upon her brown. “Never again will a place be called cruel, not when I have air in my lungs and blood in my heart.” She twines the words into Moira's mane like rotten flowers still full of seed and pollen. Isra, like a unicorn, promises not art but a world. Once in a book she read, If you don't like the world you are in, make another. Here, twisted about Moira the memory burns like embers in her skin with the fury of those words. And of course, unicorns promises are more than words. They are blood. They are heart.